When you have kids, even the most basic everyday tasks become a bit more challenging. 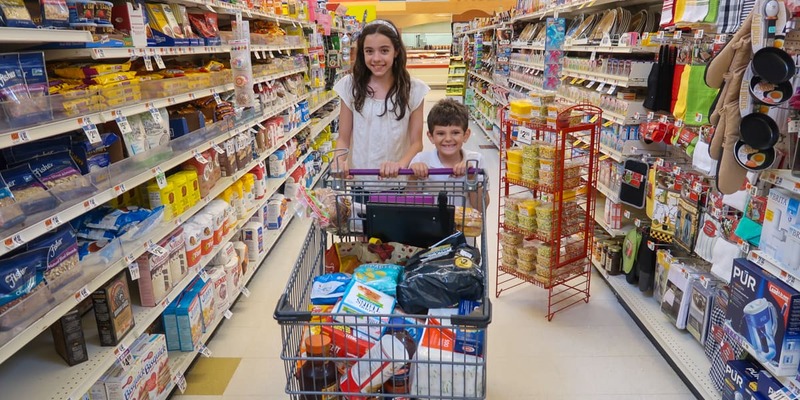 For kids, chores like shopping can be boring affairs where they are just along for the ride. And to be completely honest, grocery shopping is not exactly exciting for grown-ups either. But it doesn’t have to be that way. We’ve partnered with The Genius of Play to help families enjoy the benefits of play by coming up with ways they can work more play into their day. 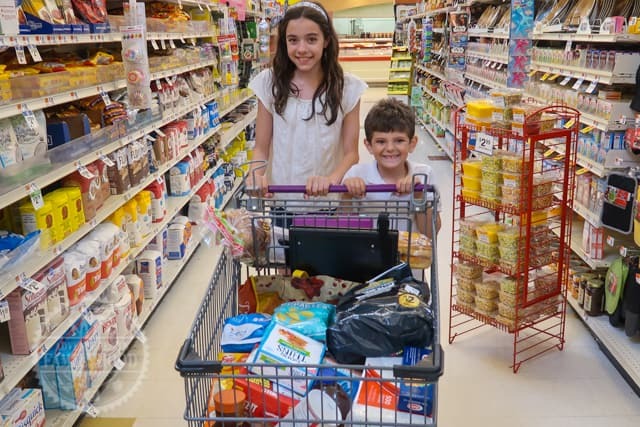 You can get kids excited to come with you to the supermarket. They can even be engaged, helpful, and learn life skills in the process. And not only that, but you’ll have a much more enjoyable experience, too! 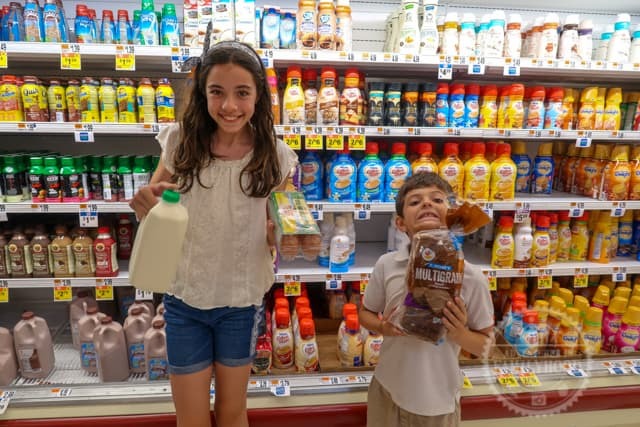 Here are 10 great grocery store games you and your kids can play together to make your next outing to the supermarket fun for the whole family. “I Spy” is a game you can play pretty much anywhere. It’s one of the first games we played with each of our kids as they discovered the world around them. But it’s not just great for toddlers who are learning simple concepts like shapes or colors. The game is easily adaptable to suit the development level of the people playing. Even adults can have fun playing “I Spy”. 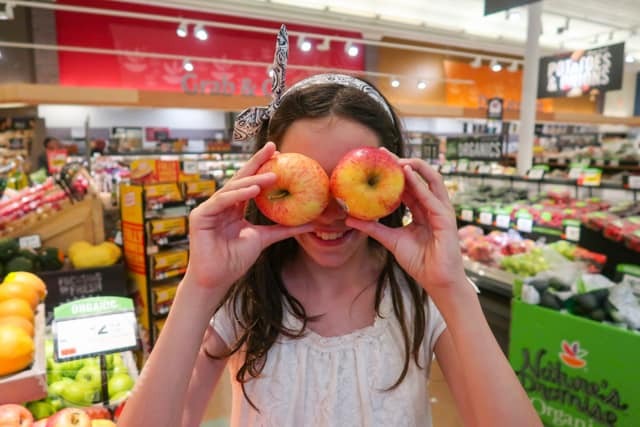 Here are a few Supermarket twists for your “I Spy” game. By Ingredient (I spy something we can use to make salad). “I went to the market” is a great game for exercising your memory with the alphabet. If you’ve never played, the game starts with the first person saying “I went to the market and bought…” and they’ll choose something you can buy in a supermarket that starts with the letter A. The next person has to repeat the sentence, including the A item and then adding the next, which would be something that begins with B. The object is to try to get all the way to Z. You can also put a twist on it by only using the letters of someone’s name or a word. 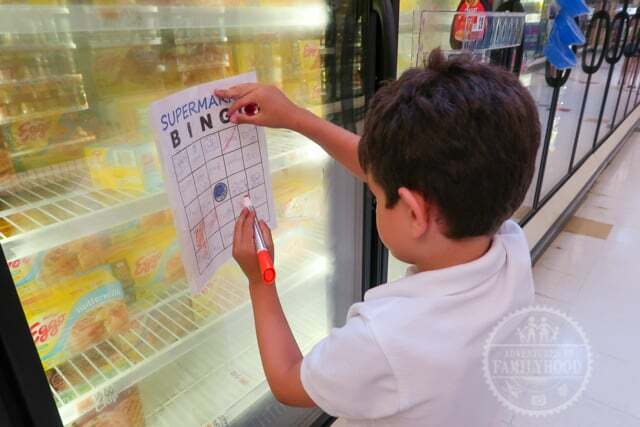 Supermarket Bingo is another super easy game to play, though it does require a game board. Dry Erase boards or boards printed on paper and put in plastic sleeves are great because they can be re-used. 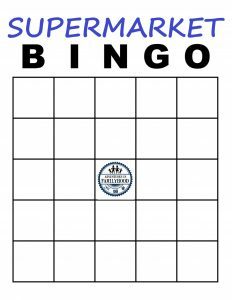 You could even make out your actual shopping list on a Bingo game board and see how many ways you can get Bingo until you get a Super Bingo by completing your list! Download our blank Supermarket Bingo Card. 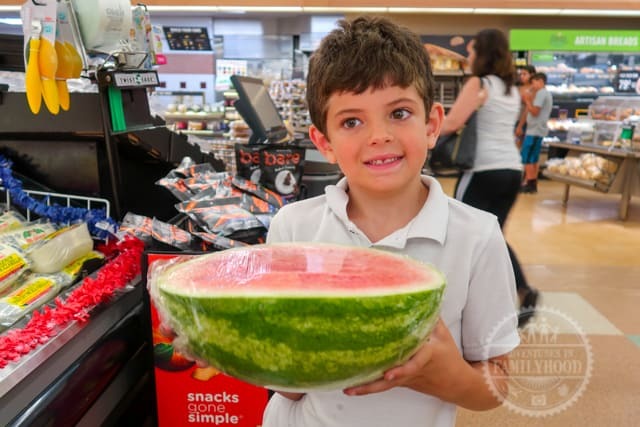 The supermarket is a great place to put those math skills to use! There are opportunities to do basic counting, addition, subtraction, multiplication, division, and even work with percentages and fractions! And by treating it like a game, you’ll help your kids develop an important skill to becoming better shoppers when they’re older. Guess the total at checkout and give and see who is closest. In essence, grocery shopping is just a big Scavenger Hunt. Your goal is to get everything on your list. Get the kids to help out with the main list or, if they are old enough, divide the items into separate lists and see who can finish their list first! 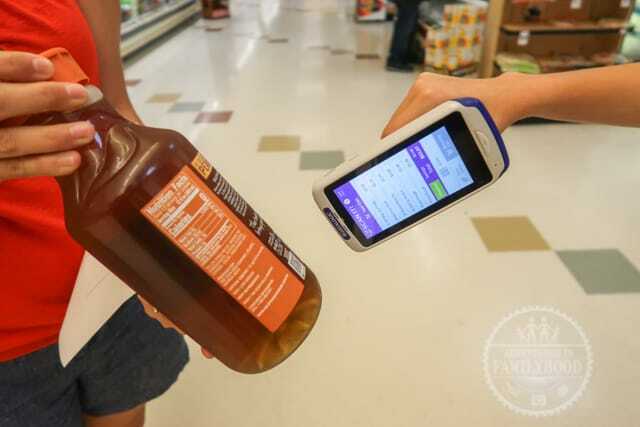 For a twist, use coupons that would have thrown away to create your scavenger hunt list. When you find each item, leave the coupon for someone who can use it. You’ll have fun AND you’ll be doing a good deed! This is a game that I came up with. Around here, whenever there is a storm, everyone runs out to the supermarket and buys up all the milk, bread, and eggs. So, to play the game, one person thinks of a scenario and the other players name the three items they would run out and buy in that situation. For instance, if you said “Grandma’s coming to visit! Quick, go get…” the kids would think of 3 things they could buy in unlimited quantities to deal with the fact that grandma is coming to visit. For the record, Bella and Jackson said we’d need chips, dip, and bottled water if their Mema was coming. Not quite the three things I thought of. But they put some thought into it, which is what matters! The crazier the situation, the crazier the answers will get! I hardly use it myself, but the kids get a kick out of the scale in the produce section. So why not let them have a little fun and learn too! As long as you’re not hogging the scale, there’s no harm in putting some items on as an experiment. And if it turns out you are actually buying something that sells by the pound, you can put them to work! How close can you get to a certain weight using different items? Can you find something small that weighs more that something big? A great hypothetical game to play anywhere, it works perfectly when limited to food at the supermarket. And if you wanted, it could be practical in helping to choose items for a meal. Getting kids in on making the decisions by giving them choices has been a helpful tactic for us. 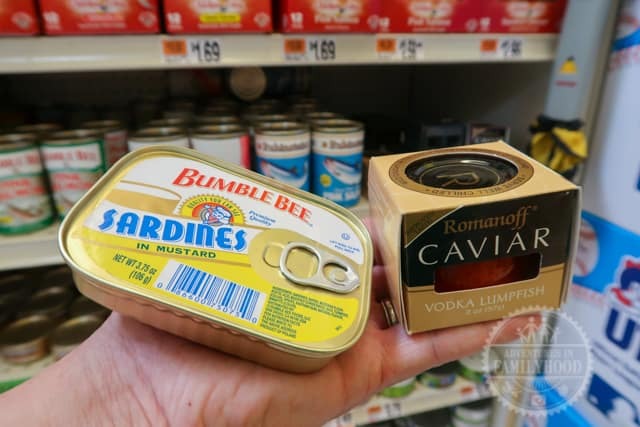 Would you rather eat sardines or caviar? Would you rather drink soy milk or almond milk? Would you rather have rice or pasta with your chicken tonight? This is a game we often play to pass the time, whether it be waiting in line, in the car, or stuck at the airport. So it makes perfect sense to play in the supermarket as we move from aisle to aisle. All you need is one person to think of an item and at least one other person to ask up to 20 yes or no questions to try and figure out what the item is. The twist in this case would be to draw inspiration from our surroundings and have every answer be something you can find in a grocery store. It’s an easy way to exercise critical thinking. Who knows, your kids may start watching cooking shows and throw out an “Apple Salmon-Crostini” the next time you ask. Any one or two of these games can make your next trip to the grocery store more fun. And most you can play just about anywhere. which makes them great options to make everything we do more playful. For more ideas on ways to incorporate play, and to see more about the many benefits of play for both kids and adults, visit The Genius of Play website, or find them on Facebook, Twitter, Pinterest, Instagram, or YouTube. 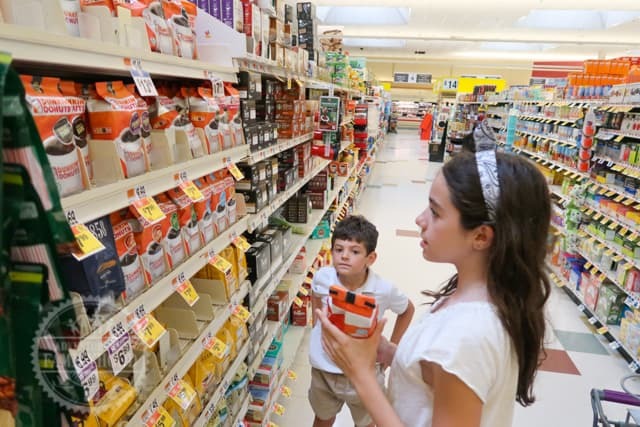 What are your favorite grocery store games? Let us know in the comments!